'A prominent activist from the violent Ukrainian neo-Nazi gang C14 spoke at an event at a US government organization in Ukraine‘s capital Kiev. The democratic revolution that ensued in Ukraine in 2014 was in fact a revolution against democracy, unleashing the dogs of thuggery and gangsterism. Someone who made the mistake of falling foul of those with a vested interest in the corruption that is a hallmark of today’s Ukraine was Katerina Gandzyuk. The anti-police corruption activist was murdered in an acid attack in Kherson, southern Ukraine. Before succumbing to her injuries, Gandzyuk alleged that “corrupt” high ranking police officers might have been behind the attack, though as yet no one has been prosecuted in connection with it. Prominent members of the far-right group Right Sector are suspected however, begging the question of where the far-right ends and the police begin? The treatment of Russian journalist Kirill Vyshinsky sheds even more light on Ukraine’s failed experiment in pro-Western democracy. The head of the Russian RIA Novosti news bureau in Ukraine, Vyshinsky was arrested in May on treason charges by Ukrainian authorities and has been held in detention ever since. Even in the face of a call for the journalist’s release by the Organization for Security and Co-operation in Europe (OSCE), a Ukrainian court has ruled that Vyshinsky’s detention be extended until the end of December. When things reach the stage that even the neocons over at the Atlantic Council are no longer able to put lipstick on the pig of the far-right swamp that is Ukraine in 2018, rock bottom has surely been reached. It all sounds so very Munich 1923, when a young Adolf Hitler and his Nazi gang of fascist thugs were shooting up beer halls on the way to turning Germany into a vast Dodge City of far-right violence, intimidation, and criminality. Yes, where now and what now? Because let us here not beat around the proverbial bush. The likes of Nuland, Ashton, McCain et al., those who promised the Ukrainian people a land of milk and honey if they would only turn their faces West, never cared one whit for the country or its people. To them, both were and remain a pawn in the game of international power politics, used as a wedge against Russia in the cause not of democracy, peace, and prosperity, but instead of containment. In truth and in sum, Jeffersonian democracy was promised to Ukraine and fascism has been delivered. Twas ever thus and ever thus shall be. And just in case anyone makes the mistake of placing Ukraine in the box marked ‘well meaning mistake’, the fate of the former Yugoslavia, whose fate was sealed according to the same hegemonic script, immediately renders nugatory this line of thinking. Economic dislocation and recession, exacerbated by the West, made Yugoslavia vulnerable to the very ethnic tensions and discord that descended upon it in the 1990s, turning the country and society in on itself to thus pave the way for Western intervention on the pretext and basis of humanitarianism, the new imperialism. Ukraine in 2014 followed much the same pattern – apart, that is, from one key difference. It is that much to the chagrin of Western neocons the Russia of 2014 and the Russia of the 1990s described two entirely different entities: the former willing and able to draw a line over which no pasaran (they shall not pass), while the latter was and could not. So there you have it: Ukraine, darling of Western neocons and ideologues in 2014, is in 2018 a place where fascism is embraced and the rule of law and human rights scorned. A society corroded from top to bottom by corruption, it is redolent of Al Capone’s Chicago in the late 1920s and early 1930s, functioning behind an increasingly thin blanket of democracy. Ukraine marks yet another dystopia cooked up in the laboratory of Western democracy, testament to the unyielding search for meaning in destruction that defines its works. 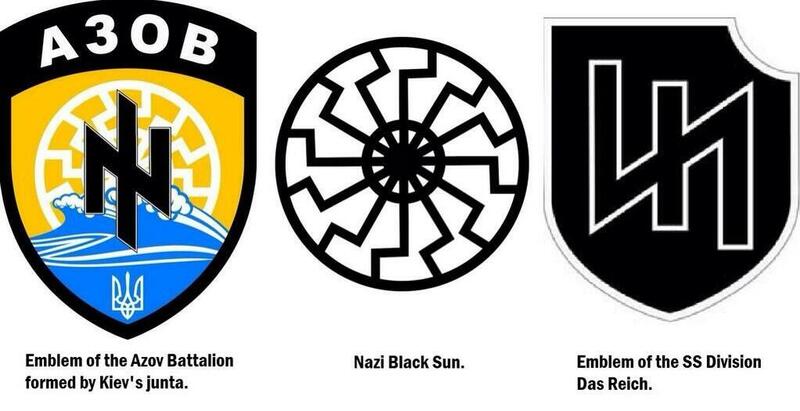 Neo-Nazi Azov Battalion . . .
Look carefully at the photographs, and you will see the insignia. Reports published by the Office of the United Nations High Commissioner for Human Rights (OHCR) have connected the Azov Battalion to alleged war crimes such as mass looting, unlawful detention, and torture. Ukraine matters. It’s territory is Europe’s largest after Russia’s. It borders seven countries in Europe’s heartland - Belarus, Hungary, Moldova, Poland, Romania, Slovakia and Russia. Separately, he said if Russia reunites with Ukraine, it'll be a Eurasian powerhouse. If Ukraine allies with Western Europe, Moscow will be significantly weakened geopolitically. 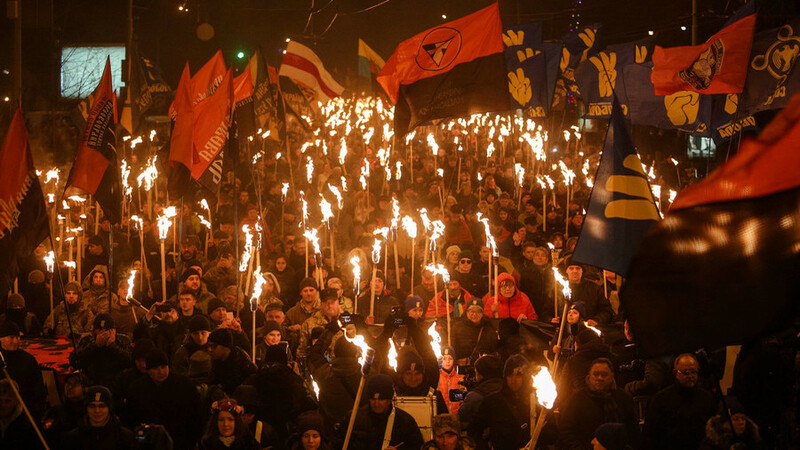 The Obama regime’s February 2014 coup d’etat replaced democratic governance in Kiev with Nazi-infested fascist tyranny. Political crisis continues to grip the continent since that time, flashpoint conditions risking East/West confrontation. Washington stops at nothing to advance its imperium. Replacing independent governments with subservient pro-Western ones is longstanding US policy - by color revolutions or naked aggression. US-installed putschists in Kiev represent mob rule. Puppet president Poroshenko and others surrounding him are societal misfits, waging war against their own people, risking war with Russia over staged provocations like Black Sea/Kerch Strait incident - likely planned and orchestrated in Washington and London. France, Germany and other EU countries rejected Poroshenko’s call for tougher sanctions on Moscow over the Kerch Strait incident - what US and UK hardliners support. She called for increased EU toughness against Russia, saying the US “has taken a very strong position in…support of Ukraine. We would like other countries to do more as well.” Spam_A Spam_B On December 10, EU foreign ministers will discuss the Kerch Strait provocation. EU leaders are expected to extend existing illegal sanctions on Russia. The order showed the incompetence, arrogance, and militancy of Poroshenko and his cronies - Russia clearly able to monitor navigation of foreign vessels near and in its waters, able to act swiftly against anything potentially dangerous to its security, precisely what happened. Kremlin spokesman Dmitry Peskov said Putin gave an exhaustive explanation of the Black Sea border incident, illustrating it clearly. He even drew a map” - explaining the provocation to Germany’s Angela Merkel. With US/UK neocon extremists supporting Ukraine’s fascist regime against Russia, anything is possible ahead - even unthinkable war in Europe’s heartland. That happened only in Ukraine? There is US installed Fascist State in Europe`s Heartland. "Republic of Kosovo". Makes me sick . . .
Its not like Russia bombed Ukraine, yet NATO bombed Serbia. Incredible. Two World wars did not happened ?? 'Grayzone Project — Petro Poroshenko, the staunchly pro-NATO president of Western ally Ukraine, posed for a photo op with a soldier wearing a Nazi symbol. #Ukraine’s President @poroshenko poses with his troops...one of whom is wearing a patch of the Nazi SS Totenkopf (Deaths Head) division. Poroshenko posted this photo on both his official Twitter profile and Facebook page. In a follow-up tweet, Poroshenko also wrote “Slava Ukrayini!” This is a Ukrainian nationalist slogan that was created in the 1920s by fascists who later became Nazi collaborators. In August, Ukraine made this fascist salute into the official greeting of its military. It was later also adopted by Ukrainian police.